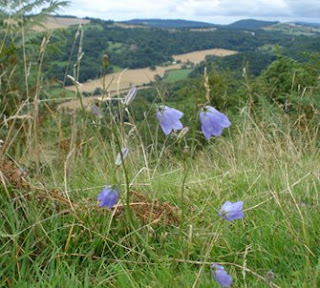 Here is picture of Harebells on Croft Ambrey. Whilst up in Herefordshire last week I took the opportunity to rebuild my long forgotten knowledge of wild flowers that my Father inspired me with as a teenager. On one day I went out for reasonably long walk (Titley to Wapley Hill and back) with the aim of drawing all the flowers and plants I didn't recognise. However, as it took me about an hour to cover the first mile with so much stopping, bending down and drawing something, only to repeat myself a few yards further on, I decided I needed a better approach. Ah, the joys of digital cameras! I was soon snapping away as well as doing the odd sketch. I was amazed at how much I found. I did another walk, a couple of days later, about 10 miles or so, and again had my head focused on the ground for much of the time (Titley to Wapley Hill, Shobdon Hill Wood, Sned Wood, Croft Ambrey and ending at Croft Castle). The photo is taken from Croft Ambrey, looking back to the hills I had just walked over. In covering so much ground and passing through so many different habitats such as river banks, conifer plantations, open heath/grassland and arable fields, I began to be accutely aware of what plants prefered which habitats and what I would be likely to find where. There were often surprises as sometimes I would find something completely new in an unexpected place. It was actually quite hard work - always looking and trying to remember what I'd seen elsewhere, but very rewarding. Although I have recently bought a new flower book it wasn't until I was back in Luton several days later that I really began the task of identifying what I saw. I had forgotten that, even with four main flower books it is not easy deciding what is what. In the field some things look so much as if they should be easily identifiable and yet the books don't quite have the perfect match. I have begun to look more clearly for the sorts of things that really identifies a plant. Umbellifers can be confusing unless you know what to look for, but it is the sort of self-heal/woundwort/calamint type of flowers that seem to get me. And even the flower books seem to illustrate the same species differently - one picture looks distinctly as if it is the wrong illustration compared to another two books! It took me hours to plough through all my drawings and photos and I only have a few plants left which I am uncertain about. On ploughing through the flower books I was amazed at just how much folklore was attached to plants in times gone by. So many were medicinal and a good number are poisonous to varying degrees. Even some of the smallest plants seem to have had some medical property attributed to them. How on earth did people find out that a tea made from a bedstraw could clear a nosebleed? Why not just stick a wadge of grass up your nose? People must have been so much in tune with plants in the past, but then I suppose we nowadays would instinctively know that lemon squash tastes better than bleach even though both may look the same, come in the came sort of plastic bottle and come from the same supermarket. One final thing. After my first long walk, and a day spent with my face in the middle of hedgerows and my nose to the ground, I came across a beautfully and immaculately trimmed hedgerow that had only just been cut by a tractor and flail mower. This represented everything I had been looking all day, now all mulched up in its prime. I know the farmers have to do it, but somehow it just showed how fragile nature's existence around us is and how much we shape it for our convenience and need. It's amazing how many things we want to know about nature when we wake up to it. I just bought a tree book the other day, and am anxious to start identifying on my next nature walk as well. Pretty soon, it will be second nature identifying things, as it should be! !